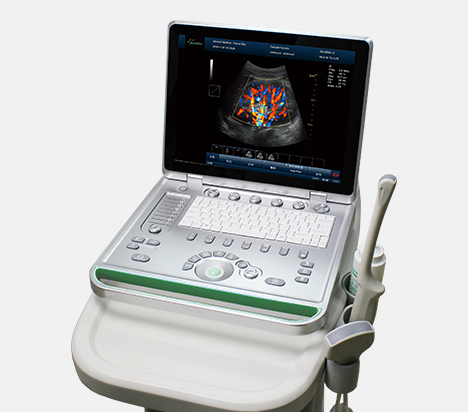 2) Have images online clipboard function: real-time scanning, only one-button operation, can store the dynamic and static ultrasound images in the clipboard which on the one side of the screen, can be took out to compare and observe. 4) With USB interface, S-VIDEO, VGA, network transmission image interface etc. 10) Display Control: Reverse Display (up and down, left and right), scanning angle three adjustable, local amplification (steeples smart zoom). 1) General measurement: distance, perimeter, area, slope, heart rate, pressure, residual urine, RI, PI, flow rate, etc. 5) Heart function, vascular measurement analysis software: ejection fraction (EF), left ventricular volume, cardiac output, the amount of (CO), pressure drop half time (PHT) MTPG, Qp / Qs, velocity integral body surface area , ICA / CCA diameter ratio, narrow percentage measuring calculation functions, etc. 6) Measurement parameters can be edited , added, deleted customize if need.